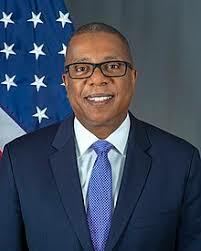 The new United States of America (USA) Ambassador to Zimbabwe, Brian Nichols on Monday paid a courtesy call on City of Masvingo mayor Collen Maboke at the council offices where they discussed various issues including the prevailing water shortages in the ancient city. Addressing the media after a closed door meeting, Nichols said he had a fruitful meeting with Maboke, deliberating on various issues including challenges in the water and sewer. "We had a very fruitful discussion; the mayor told me about various issues affecting the city including lack of consistent water supplies. Everyone knows clean and safe water are a necessity for everyone and we will continue to support the people of this country in that regard," said Nichols. Responding to questions after the briefing, Maboke said the latest problem was as a result of an electrical fault that had affected systems at the pump station. "As a city, we are experiencing a problem with our Bushmead water plant due to some electrical power faults but our engineers are doing their best to try and resolve the problem and we hope we will soon restore normal water supplies. For now, bowsers will continue to supply water in the affected areas," said Maboke. The current water deficit is the second in a space of three months. Nichols also toured the Masvingo Provincial Hospital before officially announcing a US$475 000 grant to the World Monument Fund for the preservation of Great Zimbabwe.